Within this chapter I present an original typology of children’s participation in child protection interventions. The typology was constructed by analysing the interviews I conducted with Madison, Jayden and Grace alongside children’s accounts of their experiences of participation in child protection interventions which were extracted from the existing body of literature. Constructing the typology enabled me to simplify the multitude of unique individual accounts articulated by children which, I hope, will pave the way for further discussion, critique and analysis by interested academics and professionals within the field. The types of participation presented within this chapter represent characteristics that I thought important enough to be conceptualised as tendencies of action. 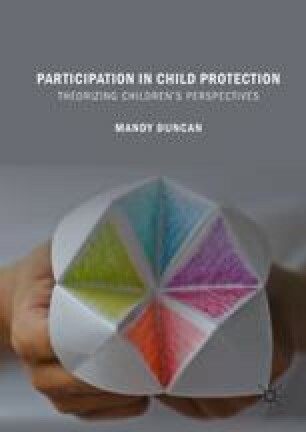 The chapter identifies constraint as a universal feature of children’s participation in child protection interventions and discusses the three tendencies of action that children employ in response to this resulting in congenial, sceptical and disaffected participation. The evidence for the constraints and types of participation experienced by children are set out in this chapter. Ofsted. (2013). Social Care Report 2012–13. Available at: www.ofsted.gov.uk/resources/120351. Accessed October 2, 2015.